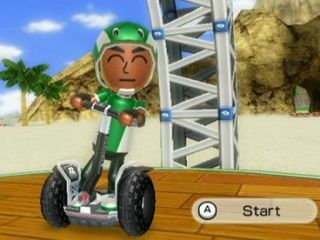 Segways are still illegal to use on British streets, so discover what all the fuss is about with a virtual Segway x2 ride in Nintendo's new Wii Fit Plus game. The Wii Balance Board accessory and Wii Remote are apparently perfectly suited to simulate what it's like to ride a Segway x2 - apart from the pointed fingers and muffled sniggers from passers-by, of course. In the game, the players' Mii character zips around levels trying to pop balloons and tag a run-away mole-like creature that comes up out of the ground. (Note: do not use real-life Segway for vermin control). Eric Fleming, Segway's Director of Creative Services, said: "There are so many people who are curious about what it's like to ride a Segway PT. This game is the closest you can get without actually riding one. In addition, it's a great way for the entire family to have a positive experience with our brand." (Ie. one that doesn't involve pointed fingers and muffled sniggers). To control the game, a player stands on the balance board while holding the remote in his or her hands (like gripping a handlebar). To move, the rider keeps his feet firmly planted as he shifts his weight forward, back, left or right. Wii Fit Plus, and its new software, will available "later this year" but you can buy a new Segway right now (well, as long as you live in the US and are a cop) - the company also released new Patroller i2 and x2 models today. The scooters have built-in reflectors and lights, plus a "handlebar bag" (that's handDLEBAR bag, not handbag) large enough to store an enforcement officer's regulation aviator shades, nightstick and doughnuts.